Unknown to them, Hmuichukchuriduninu was listening carefully to the entire conversation, so she ran home and cleared up the path that led to her house. She then piled up all the dirt and the debris along the path that led to Nuchhimi’s aunt’s house. After a time, Nuchhimi and her younger brother set off towards their aunt’s house. They followed the instructions which their mother had given them and very soon they came to the path which was neat and clean. And because they thought that the clean pathway was the path that they had to follow, they went up the path and finally they reached the house of Hmuichukchuriduninu and delivered the pork to her. When it was dusk and as night fell gradually, Hmuichukchuriduninu told Nuchhimi, “I will cradle your little brother in my arms at night and you can sleep by yourself in the corner.” And in that manner they went to sleep. She pulled the blanket over herself and the white ants bit her all over her body. She grabbed hold of the bedpost in a bid to escape, only to smear dirt all over herself. She then tried to clean herself by wiping her hands on the wall of her hut, only to be pierced by the sharp bamboo knife that had been cleverly inserted in it. She then tried to smear some oil over her wounds but the moment she poured the oil over herself, the tiny red ants began biting her. In alarm she cried, “There are too many pests inside my house. I must escape.” And as she ran out the large wooden pestle hit hard against her. And she began to jump about in painful frenzy. Soon the platform gave way under her weight. The ferocious dog and the equally wild goat began to bite her viciously. A little later Hmuichukchuriduninu died, much to the delight of Nuchhimi and her family, who headed for home and lived happily every after. thuziak sawi hmain painting hi kan sawi lawk. Ka ziak thiam ve miah lo na in. Rules of third a hmang diklo tlatin ka hria.Keimah ka dik lo nge, puanzar hi a langsar (lian + colorful) lutuk a, hei hian centre of attraction atan a duh ber a pawt peng ka ti. Puanzar khian ka mit a la hmasaber tlat. A dawtah naupangte khi. 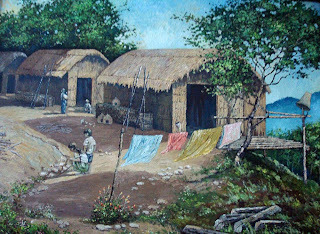 Painting bawk khi - Mizo in a ni lo tiraw? An dawh kang lova. Ngaihnawm ve. Kan naupan laia ka nuin min hrilh lai ka hre chhuak zawk mai. Ka mithlaah Hmuichukchuriduni hmel a la lang tlat.. Jerry chu ni ila a hmel hi ka paint thiam ngei ang le.. Ka ni si lo hi chu...! Jerry-a painting khian a solo exhibition ka kala ka lung tileng ve ringawt tu a nih khi.. Critical appreciation lam chu midang tihah dah teh ang. I found your blog browsing through the internet, from one blog to the other. What a wonderful idea to translate Mizo literature to showcase to a broader audience. Please keep it up! Sharmishtha, thank you so much for your interest. Do spread the word. pezo, a dang pawh kha lo chhiar zel rawh. @amuana: agreed the hanging clothes are what catch the eye first. is there any particular reason the children should have? The title literally translates into "Ka u, is that a caterpillar" which brings the focus bang on the kids. But as I said earlier, let's give Jerry, who's the son of one of the most respected names in Mizo politics Pu HK Bawihchhuaka and is also a close family friend, credit for taking artistic license in his creation of this evocative piece of art. I like it so very much.